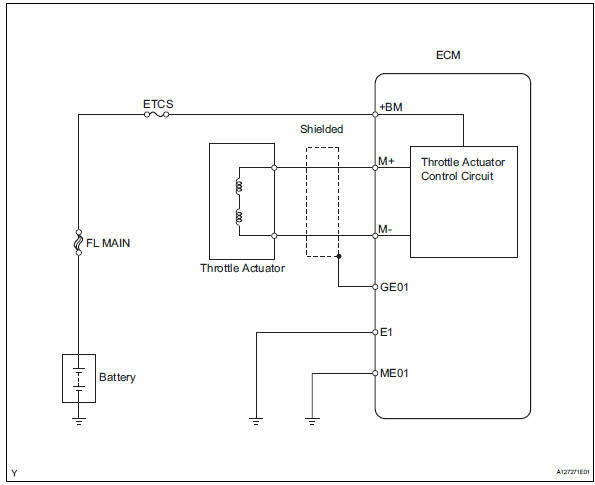 The etcs (electronic throttle control system) has a dedicated power supply circuit. 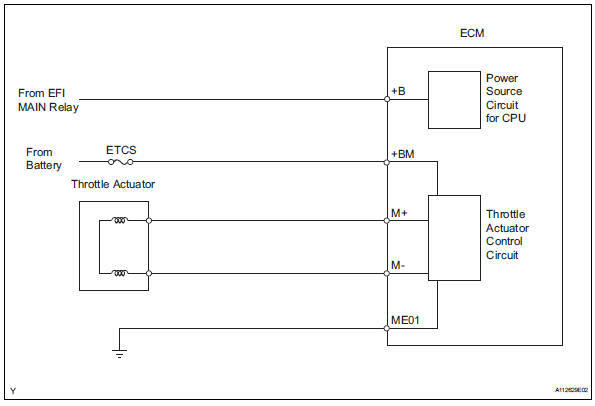 The voltage (+bm) is monitored and when it is low (less than 4 v), the ecm determines that there is a malfunction in the etcs and cuts off the current to the throttle actuator. When the voltage becomes unstable, the etcs itself becomes unstable. For this reason, when the voltage is low, the current to the throttle actuator is cut. If repairs are made and the system returns to normal, turn the ignition switch off. The ecm then allows the current to flow to the throttle actuator so that it can be restarted. The etcs does not use a throttle cable. When the power supply voltage (+bm) drops below 4 v for 0.8 Seconds or more, the ecm interprets this as an open in the power supply circuit (+bm). The ecm illuminates the mil and sets the dtc. If the malfunction is not repaired successfully, the dtc is set 5 seconds after the engine is next started. When this dtc, or other dtcs relating to etcs (electronic throttle control system) malfunctions, are set, the ecm enters fail-safe mode. During fail-safe mode, the ecm cuts the current to the throttle actuator off, and the throttle valve is returned to a 6° throttle angle by the return spring. The ecm then adjusts the engine output by controlling the fuel injection (intermittent fuel-cut) and ignition timing, in accordance with the accelerator pedal opening angle, to allow the vehicle to continue at a minimal speed. If the accelerator pedal is depressed firmly and gently, the vehicle can be driven slowly. Select the following menu items: diagnosis / enhanced obd ii / data list / +bm voltage. 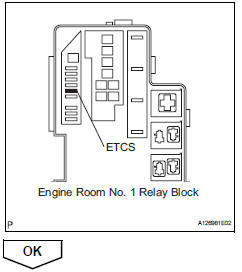 Remove the etcs fuse from the engine room no. 1 Relay block. Measure the etcs fuse resistance. 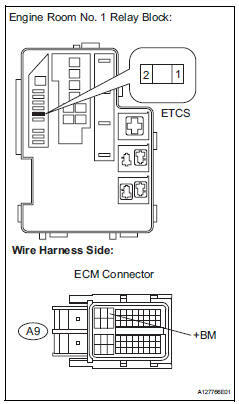 Check the harness and connector between the etcs fuse and ecm. Check the harness and connector between the etcs fuse and positive battery cable. Disconnect the cable from the positive (+) battery terminal. Reconnect the cable to the positive (+) battery terminal. 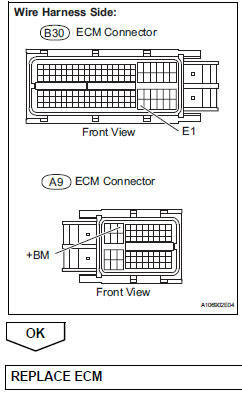 Measure the voltage between the terminals of the a9 and b30 ecm connectors. Check that the battery terminals and ecm ground are not loose or corroded.